Ayatollah Akbar Hashemi Rafsanjani today registered to run for another term as president in the 14 June election. The long-anticipated decision came only minutes before the deadline. Rafsanjani will now be the frontrunner in the race and his entry would change the composition of the race significantly. The ‘principlist’ (conservative) groups who have fielded a number of candidates are now expected to attempt uniting behind a single candidate capable to challenge Rafsanjani. The name most discussed is Mohammad Bagher Qalibaf, the mayor of Tehran. 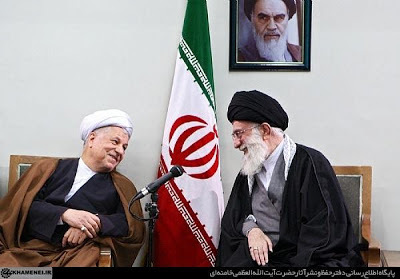 Akbar Hashemi Rafsanjani, 78 years old, has served as president of Iran for eight years (1989-1997); as speaker of Majlis for nine years (1980-1989) and was the de facto commander-in-chief of the Iranian armed forces during the eight-year Iran-Iraq war (1980-1988). He is currently the chairman of the Expediency Council. A new Rafsanjani presidency would be seen as the complete repudiation of eight years of hardline policies championed by Ahmadinejad and a new beginning to bring normalcy to the country’s economy and its foreign relations. Now is the time to prop your feet up, grab a glass of your favorite poison and watch the greatest show on earth as the presidential campaign commence .... Cannot wait! Oops! I meant to say "your favourite yogurt drink". Good tactical move by the establishment. This way all will be mobilized to participate, and apathy (what Pahlavis entourage were hoping for) is herewith out of the question. I hope people of Iran are vigilant and not constantly look for a basiji type if such things happen but go for the clean shaven and women with large handbags ;) . Back to the race, I doubt he brings more than 35% but the issue is he is over the age of limit and probably recons with the disqualification and maybe hopes for a backlash. The order his brother brought from Iraq were probably from the green zone lool. My prediction is that Qalibaf who is a war veteran and a good sound administrator will win. Rafsanjani is widely detested for his corruption and family fortune. It will be like back to the future. The next question is how many candidates will be qualified for the ballot? Also, if Rasfanjani and Meshaei are qualified to be on the ballot, what will their respective campaign styles be like? Rasfanjani's 2005 "American style campaign effort (complete with car bumper stickers) was widely seen as a failure. And will Meshaei replicate an Ahmadinejad grass roots style campaign with Ahmadinejad at his side? Qalibaf is much liked in Tehran for his efficiency and civic developments. Will this be enough to win over the entire country? Many questions to ask going into one of the most interesting elections ever. Mr. S. Jalili could be a very interesting choice too. He is a veteran, who lost his leg during the previous war and possesses diplomatic skills and a foreign respect. I agree that it could be a rough ride if Mr. Mashaei gets into the final round of presidential election. Mr. Jalili can show successes as a skilled chairman of the negotiating team, who secured additional time for defenses of the Islamic Republic. Conservatives may handle their own internal differences, by offering; in advance, ministerial or vice presidential posts, before final round or results of presidential elections. P.S. would you please, if interested, to check my May9,10, 2013 comments, if they were posted at the article containing a photo of the Rasht's air terminal.